A portion of all proceeds from nomination fees will be donated to the nonprofit. 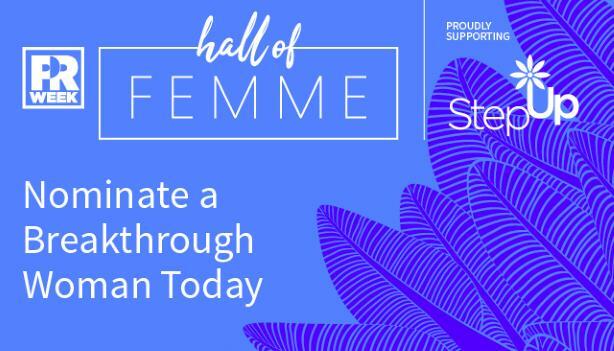 For the first time, PRWeek US has partnered with nonprofit Step Up to amplify the shared mission of female empowerment through the 2019 Hall of Femme. A portion of all proceeds from nomination fees will be donated to Step Up. The support will help girls living or going to school in under-resourced communities fulfill their potential by empowering them to become confident, college-bound, career-focused, and ready to join the next generation of professional women. PRWeek’s Hall of Femme and Women to Watch honor inspiring women who set the bar higher within their organizations. These U.S. communications pros are up for every challenge and ready to go above and beyond to ensure results exceed business goals and achieve creative excellence. "As a board member of Step Up, I am thrilled we will be able to leverage our experience and extend our mentoring beyond our industry to volunteer to help girls from under-represented communities reach their full potential and find more careers in our industry and beyond," said Ketchum CEO Barri Rafferty, chair of the national board of Step Up. "By using our skill sets to help them write their college essays, explore secondary education options, and secure financial aid, we will be able to enhance their courage and confidence and achieve their ambitions." Hall of Femme candidates must be at an SVP or higher level, ideally reporting to the CEO or president, and having made a significant impact on their organization's success in the past year. All potential honorees must be nominated by a peer. Women to Watch must be VP level and below and have demonstrated standout work in some way, such as leading a project, developing a campaign, or affecting their organization's financial performance. Potential Women to Watch can be self-nominated. Nominations are due on December 14. Join us on June 5 in New York City, where we will honor all of our Hall of Femme honorees and Women to Watch. We will also be tackling the issues that face female professionals in the industry.